Marvel Studios’ ‘Avengers: Endgame’ is all set to hit the screens on the 26th of April. The movie will also release in Tamil, Telugu, and Hindi in India. Director A.R.Murugadoss has written the dialogues for the Tamil version of the movie. 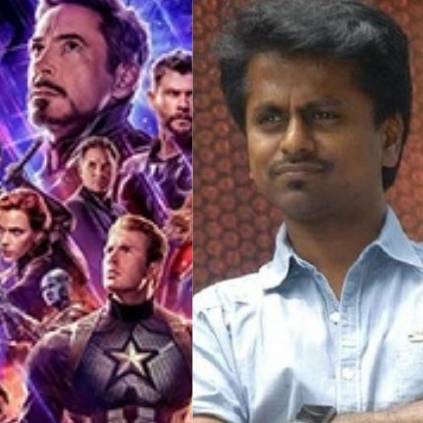 There are a lot of speculations surfacing on the internet about AR Murugadoss' involvement in the dubbing of the Tamil version. When we got in touch with AR Murugadoss, he said, “My role with the Tamil dubbed version was only to write the dialogues, and I delivered it, that’s all." ‘Avengers: Endgame’ stars Robert Downey Jr, Chris Hemsworth, Scarlett Johansson, Chris Evans, Brie Larson and others in lead roles. How the Avengers retrieve half of the human race who died after Thanos’ snap forms the crux of the story. People looking for online information on AR Murugadoss, Avengers Endgame, Avengers Endgame Tamil trailer, Vijay Sethupathi will find this news story useful.